In August, Mozilla’s Director of Research Andreas Gal, and one of the lead engineers for Firefox OS, Philipp von Weitershausen, gave a couple of presentations in Brazil about Firefox OS. We’re now happy to share both the videos and the slides, in various formats for you to see or use, giving your own presentations! Note: if you’ve opted in to HTML5 on YouTube you will get HTML5 video. We’ve also made these slide decks available in other formats if you want to reuse them and give your own presentations about Firefox OS (and if you love talking about the Open Web, have you considered becoming an Evangelism Rep?). One question: when will you decide it’s time to make b2g work on desktop windows? It’s a prerequisite to get more people on the project. When it comes to building Firefox OS and flashing it on phones, I’m not sure when that would become available on Windows. The general goal at the moment, though, is to give people the chance to try out apps on Firefox OS without the need for a device, and there r2d2b2g is the best option now. I though the comment was in reference to building Firefox OS and flashing devices. When it comes to desktop builds of Firefox, they do exist on Windows, but I believe r2d2b2g is a better option for most then. I’ve installed r2d2b2g on both Windows 7 and Mint 13 x64. And the experience is very bad – too laggy and buggy, don’t work like normal for me. It’s a work in progress. But they are more than open for feedback! Please comment on the post linked above. When are you going to introduce a resizable b2g? Tough, it seems to work in the browser somehow. Where do you see the black bars? On a device with Firefox OS installed? The idea is that the UI shall be responsive. 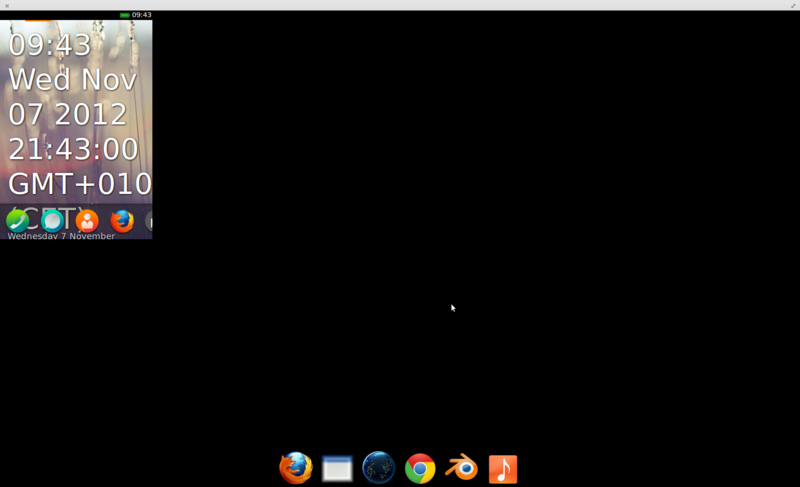 In the Firefox OS desktop build? I see. Best thing there is probably to file a bug for the B2G builds. It could be that this is a duplicate. Could be, but that’s ok. Thanks for reporting! Can you use the `let` and `const` keywords by default? Is there proper remote debugging à la Opera or Chrome? There is remote debugging for Firefox on Android. When it comes to Firefox OS, you have a number of options listed in the Firefox OS Debugging documentation. The remote debugging video looks great. Hope this lands in Firefox OS soon-ish. I clone b2g & ran `./configure.sh emulator` almost 1 GB of space was used still clone wasn’t complete. Apparently I heard in IRC normal setup is 6 – 9GB of space. during clone I noticed all android tags of v1.1 and older was cloned. It really pissed off and pl rethink this strategy . I believe that it’s not optimal, but it has been the best way at the moment to ensure that things work for you. Building the entire thing is a, currently, not for the faint of heart. I’d personally recommend r2d2b2g or the desktop builds if you want to test it, unless you have very specific reasons to hack on low level things for Firefox OS. Also, as you mentioned, people in Mozilla’s IRC can be very helpful with advice on what’s best, in channels like #b2g and #gaia. Congratulation , that’s a great idea and i’m sure it will work. Where can i find the doc about Firefox OS apu ? There is an entire section on MDN with Firefox OS documentation. Why the Mozilla Dev Team always use Macbook for their conference? Within Mozilla, we use both Windows, Mac OS X and a variety of Linux flavors. With that said, Mac OS X has been pretty popular. I can only say for me personally, but for me Mac OS X offers a really good mix of good and consistent UI while I also have the power of the terminal and hacking things that way. It looks great and I want this to be available on handsets in the UK. Just one word of warning: if a phone user has to *ever* register an account to be allowed to download a free app, you will have failed. This also goes for if they have to hand over personal details to be allowed to use the phone for the first time. I have the right to not trust Mozilla with my data any more than anybody else. All companies are fallible, all technology is too and the safest and must trustworthy thing is to not store personal details at all. I’m seriously worried about the entire market of devices (iOS / Android & Windows 8) *all* requiring users to register accounts and hand over large amounts of personal data just to be able to effectively turn the device on. It’s scary, really scary if this were all to backfire at some point in the future. Thanks for your comment. I agree user data is a very sensitive topic, and has to be handled with the greatest care. At this time, you can install any app without giving user data. For Marketplaces (not just Mozilla Marketplace will be the only option to install from) it will be up to each of them what they will request. Projects like firefox os are really inspiring to me. Thank you and Mozilla foundation . I purchased a Samsung Nexus S last week for the exact reason to try B2G/FirefoxOS on a device, first-hand. Right now, based on the desktop builds and r2d2b2g, I’m waiting for the OS, especially GAIA to mature but I am very excited and looking forward to seeing this become a reality. Hope all goes well, and can’t wait to see B2G devices flood the market! Keep up the amazing work and the good spirit! You are supposed to, at least. I guess you need to talk to Google about that. Amazing videos! solved too many questions !! !Thank you very very much!!! * when I give access to apps (gps etc) can easily say no i don’t want now this apps have access and easy close by the phone. 2.also the git link (https://github.com/mozilla-b2g) mast add on MDN as official repository because was looking for repository and i have found the git but i thought it was clone and I’m confused :) the repository is important when someone wants to help with some tools like git (tools) and Tortoisegit (for win). Regarding the 4 things wish list, I hope we will see them too, but I just can’t promise anything. With the videos, we made the decision that YouTube is the de facto channel, and the exposure we get there is really good. Besides, they do serve it as HTML5 video for those who have opted-in. Again, glad you like it and I hope you will appreciate where it is going! This is the most important of all !!! Mostly Git for me, at least! I would love to see Firefox OS knock the socks off of Android! There’s so much potential for App developers and simplicity always wins.